While a midweek storm will spare much of the northeastern US from receiving heavy snow, the storm will hit northern New England and neighboring Canada hard with more snow and wind. The storm threatens to deposit another foot (30 cm) of snow in part of the region, following the general 1 to 2 feet (30 to 60 cm) of snow that fell at the start of the week. Local amounts in Maine reached 40 inches with drifts to 8 feet on Monday. Even in areas that escape the heavy snow, winds can become strong enough to cause minor travel problems over much of the northeastern U.S. during the middle and latter part of the week. "Two storms, one from the South and one from central Canada, will merge near northern New England and the Maritime Provinces of Canada," according to AccuWeather Senior Meteorologist Brett Anderson. The southern storm spread drenching rain and locally severe thunderstorms across the Deep South on Tuesday which will move into the Southeast on Wednesday. A great deal of eastward momentum with the Southern storm and its moisture will prevent heavy snow and rain from falling on most of the mid-Atlantic region. However, soaking rain will fall on part of southern Virginia, the Delmarva Peninsula and the Carolinas. Meanwhile, the storm from central Canada will have limited moisture to work with until it reaches northern New England. As a result, only intermittent snow will spread across the Great Lakes with rain and snow showers over the mid-Atlantic on Wednesday. As the storms merge near the New England coast, snow will become steadier and heavier over parts of Vermont, New Hampshire and Maine on Wednesday. 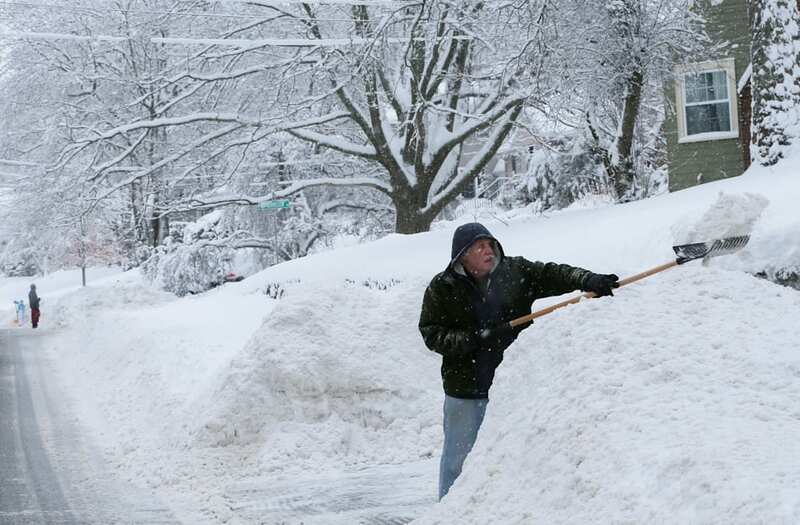 "At this time, it looks like the bulk of the storm will be north of Boston," Anderson said. "The worst of the storm will be from Maine to New Brunswick, Prince Edward Island and northern Nova Scotia during Wednesday night into Thursday." Enough snow to shovel and plow is likely. As winds increase, blowing and drifting snow will add to travel difficulties for motorists. Some roads that opened briefly by midweek may be shut down again due to treacherous conditions. Some communities will face a major challenge as to where to put all of the snow from the series of major storms. Over parts of Massachusetts, rain or a mix of rain and snow may change to a period of snow and could result in slippery travel later Wednesday. While portions of upstate New York and western and northern Pennsylvania will escape the bulk of the snow, intermittent snow can occur on Wednesday ahead of lake-effect snow squalls Wednesday night into Thursday. The storms will merge too late and too far to the northeast to bring significant precipitation to the Great Lakes, mid-Atlantic and southern New England regions. However, winds will kick up from Wednesday to Thursday. "While winds will not be as strong as that of this past Sunday night to Monday, they can still cause some airline delays and challenging crosswinds for high-profile vehicles," Anderson said. View of a car buried in snow during the so-called Knickerbocker Storm, a blizzard that dropped 28 inches of snow on Washington DC, January 28, 1922. The storm, which also affected a large portion of the Eastern Seaboard, was named after the collapse of DC's Knickerbocker Theatre, caused by the excess weight of the snow on the structure's roof, which resulted in 98 deaths and 113 injuries; later, both the building's owner and architect committed suicide. A man stands by a snow hut, after the Great Blizzard of 1888, with U.S. Capitol in background, Washington, D.C. According to History.com, 55 inches of snow piled up in some areas and hundreds of people were killed. The Blizzard of '96 was a severe nor'easter that paralyzed the U.S. East Coast with up to 4 feet of wind-driven snow from January 6 to January 8, 1996. It is one of only two snowstorms to receive the top rating of 5, or 'Extreme', on the Northeast Snowfall Impact Scale. Looking west down Penn. Ave from the US Capitol during the Blizzard. Journeying outside of the Unites States, Tibet got a surprise storm that lasted 36 hours and dropped upwards of five feet of snow causing buildings to collapse and at least seven deaths. Number six is the storm on Mount Shasta in California in 1959 which unloaded 189 inches of snow on the locals and is considered the largest snowfall from a single storm in North America according to NOAA. At number two is the blizzard of '77 in Buffalo, New York. Powerful and sustained winds created massive snow drifts. Next is the Eastern Canadian Blizzard of 1971. It is said the event closed down the Montreal Forum, canceling a Montreal Canadiens hockey game, something that hasn't occurred since the flu epidemic of 1918. At number four is the New England Blizzard of 1978. Stalling over New England, this storm struck during the day, dropping over 27 inches of snow and stranding many at schools, businesses and others in their cars. Then there was the Great Snow of 1717 over the New England Area. With five feet of snow already on the ground, around four more fell on top of that creating drifts as tall as 25 feet, burying entire houses. But the storm to top them all is the Blizzard of 1967. Laying waste to the Midwest, this storm took 76 lives, set the record snowfall for Chicago with 23 inches and was preceded by a severe tornado outbreak with temperatures in the 60's. In the wake of the storm, parts of northern New England and Atlantic Canada will have a yard (meter) or more of snow on the ground. "This much snow on the ground over such a large area could pose a problem in the weeks ahead," Anderson said. "Anything less than a gradual thaw could lead to flooding problems." The weather during next week is projected to feature some days with temperatures above freezing and nights below freezing, which could slowly melt some of the snow. The melting and freezing cycles could lead to areas of black ice on roadways and sidewalks and damaging ice dams on roofs.